Although conditions were already soggy from rain showers over the past several days, a significant storm front tore across southern Minnesota Thursday, dropping anywhere from 0.5 to over 3 inches of rain across the region. For the month of September to date, many parts of southern Minnesota have received 6 to 9 inches of rain. Soggy conditions have halted harvest across the region and water is standing once again in areas impacted by wet conditions earlier in the growing season. With corn and soybeans at or very close to physiological maturity, keep in mind the following as we wait for field conditions to improve and harvest to proceed. Keep an eye on corn stalk quality: Wet soil conditions this spring have set up some fields for potential stalk rot problems. Waterlogged soils can hinder root growth, leading to compromised root systems that are not able to take up enough water and nutrients to adequately support plant growth and carbohydrate production. Ears will continue to take what is needed to fill grain, so when carbohydrate production is below normal, this can result in poor stalk quality as stalks are depleted of carbohydrates. Soil compaction, severe drought, and pressure from pests like corn rootworm can also inhibit root growth and contribute to stalk quality problems. Although some of the fungi causing stalk rots are a player in the natural process of recycling nutrients and organic matter back into the soil, decay of stalk pith prior to harvest can increase lodging potential. Harvest delays increase the chance of lodging due to stalk rots and lodged plants decrease harvestability, leading to ears being left in the field. To check for stalk rot, stalks can be split (check for stalk tissue disintegration), squeezed between your fingers (check if stalks are easily crushed by squeezing the second or third internode on the stalk above the soil surface), or pushed to a 45 degree angle (severely rotted stalks will kink or lodge). Fields where more than 10% of the plants show stalk quality issues should be targeted for harvest as soon as feasible because of increased lodging potential. Fields with heavy infestations of European corn borer should also be targeted for harvest as soon as feasible. Watch for ear rots and mold: Corn grain quality can also be a concern when wet conditions delay harvest, particularly where ears may have been submerged in standing water for a period of time, such as in low spots of fields. Be on the lookout for ear rots. If grain becomes molded, test for mycotoxins prior to feeding to livestock. 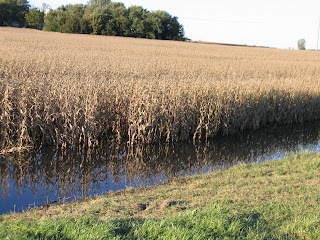 Watch for soybean quality issues: In soybean fields where pods were submerged in standing water for a significant time period, seed quality is a concern. Wet conditions combined with warm temperatures increase the risk of damage from fungal pathogens. If areas are submerged for several days, stems may weaken or rot, increasing the chance of lodging and harvest losses. Prior injury from hail or stem diseases may predispose plants to further injury. Pod shatter prior to harvest is also of concern, especially if soybeans go through several cycles of drying and re-wetting. Consider segregating grain with quality issues: If soybeans were submerged in areas of the field, consider segregating these potentially lower quality soybeans. Segregation may be particularly beneficial if soybeans were intended to be sold to a specialty market where premiums are based on soybean quality. Consider segregating corn with potential quality issues as well. Prioritize fields: Delayed harvest will also influence the ability to conduct fall tillage operations and fertilizer applications. The main focus is, of course, to get crops out of the field. As field conditions improve and harvest resumes, keep an eye on crop status when deciding which fields to harvest next to help maximize crop quality and yield.